Mirage was developed at Bell Labs by Tin Kam Ho. The application below is a wrapper around Mirage, without modification of Mirage itself. Mirage must be downloaded from the Bell labs site directly (link at bottom of page). 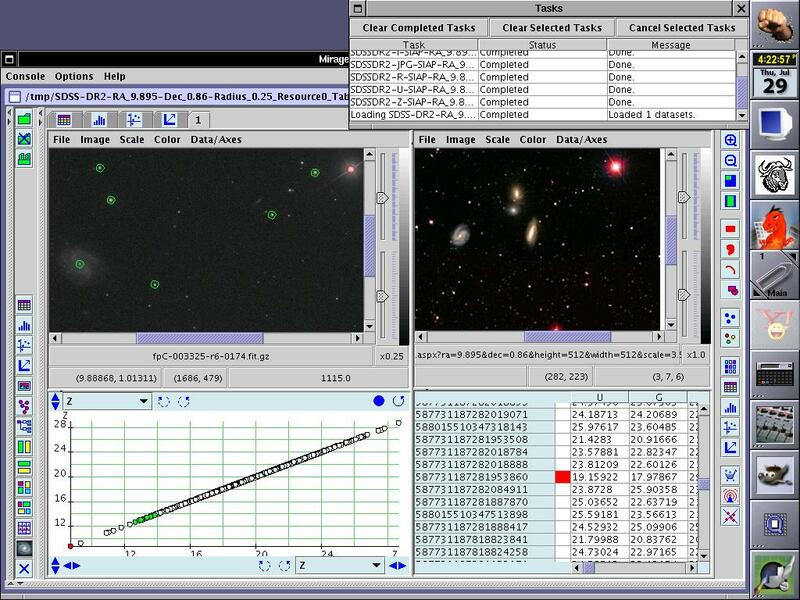 Mirage, screenshot below, uses the IVOA Client Package to load VOTables for analysis of Virtual Observatory Data as well as the IVOA FITS Package for FITS image support. Mirage is a Java-based software tool for exploratory analysis and visualization of classification and proximity structures of multi-dimensional numerical data from an arbitrary domain of study. The tool shows projected images of point classes and traversals of proximity structures in one, two, or higher dimensional subspaces, in linked views of tables, histograms, scatter plots, parallel coordinate plots, graphs, and trees, and over image or hypertext backgrounds linked with the data. It also provides facilities for arbitrary plot configuration, manual or automatic classification, and intuitive graphical querying. Analysis and visualization operations are controlled by a small, interpreted command language. For more information on Mirage, see the official Mirage web page at http://cm.bell-labs.com/who/tkh/mirage/index.html. This version of Mirage allows loading of VOTable data from files, Cone and SIAP Searches, and SDSS CAS searches. Detailed instructions on how to use Mirage may be found at http://cm.bell-labs.com/who/tkh/mirage/index.html. There are two ways to access VO data outlined below. In order to load a VOTable data file, simply load it as you would load any other data file. Under the "Console" Menu, choose "New Dataset" and use the file browser to locate your file. You may also specify the file name(s) on the command line when you start mirage. A VO specific menu entry has been added to the "Console" menu, namely "New Dataset from VO Source...". Upon choosing this option, a dialog appears offering the option of "CONE" or "CAS". CAS allows a query to be sent to the SDSS Skyserver. Cone and SIAP query the registry and offer a list of Cone and SIAP Services and the ability to put in the RA, DEC and SR parameters to send to the service(s). The VOTables returned by the Cone services are loaded as separate datasets in Mirage, and the image URLs returned by the SIAP service(s) are added to an option list in the astronomical imaging module (see below for details on this module). As of VO Enabled Mirage Version 0.2, there is a Task Manager which pops up when data is being loaded. This exists primarily to give users a way to cancel connections to non-responsive remote VO sources. To cancel a connection, select the associated task in the Task Manager and click "Cancel Selected Tasks". If the Task Manager becomes cluttered with cancelled and completed tasks, you can clear out old tasks by selecting them and pressing "Clear Selected Tasks". Note that if you try clearing a task which is running, the Task Manager will cancel the task and then clear it. The Cone/SIAP/CAS dialog and the Task Manager are also distributed separately in the IVOA Client Package for use by other Java applications. There is now an imaging module which allows viewing of FITS images as well as JPEG and GIF images. The imaging module uses classes included in the JSky application for WCS support, as well the colormaps which come with JSky, all of which are included in the VO Enabled Mirage distribution. To access the imaging module with the new version of Mirage, select the multi-panel tab pane from the dataset view, then drag the spiral galaxy icon found on the lower left tool palette into one of the module panes. Image loading is fairly straightforward using the "File" menu in the imaging module's menu bar. Images can be loaded from any URI including file and HTTP URIs. If any SIAP searches have returned image URLs, you may also select from among these in the pulldown menu on the combo box in the file loading panel. Currently, when loading images, the imaging module runs in the main thread and blocks until loading is finished either normally or abnormally. On very large images, like many astronomical images tend to be, this can give the impression that the application is frozen. In every case that we have tested, the application has returned. Fixing this flaw is a planned future enhancement. Image axes, in either image coordinates or WCS for those images with WCS information, may be related to dataset columns using the "Data/Axes" menu. Images have x and y axes which can be associated with dataset columns. Images with WCS information also have RA and Dec axes which can be associated with appropriate columns. Thus, for instance, one can select data rows in the table view, then press the broadcast button found at the bottom of the tool palette on the right, and if the image coordinates obtained from the RA and Dec fields of the dataset fall within the image boundaries and the correct axis association has been set, the associated points on the image will be circled. Selections can be made in the imaging module itself by selecting the rectangular selection tool in the toolbar and then selecting as one normally would in any other application. The selection can then be broadcast to the other view modules by pressing the broadcast button. Data points can be marked with different colors via the color palette which can be accessed by pressing the colored grid icon in the middle of the tool palette on the right side. You may zoom in on a region of the image by selecting either the "zoom in" tool or the "zoom out" tool in the toolbar and then clicking on the image. The zoomed image will be centered on the position which was clicked. Both zoom tools can have their behavior inverted by pressing and holding the control key. Brightness can be controlled with the bias control, the top slider on the right side of the pane, and contrast can be controlled with the bottom slider right below the bias slider. Colormaps may be selected and inverted using the "Color" menu. For FITS image with overlapping WCS ranges, zoom and pan operations are synchronized. That is, if you zoom in one FITS image, all other FITS images are zoomed to the same scale factor. If you pan in one FITS image, any FITS images which contain the new center point (in WCS) will also center on that point. Images without WCS or with a WCS range not containing that point will silently do nothing. However, all FITS images will zoom to the same scale factor regardless of whether they overlap. One known bug is that if an image is flipped, it must manually be recentered either by panning in normal fashion or by "jiggling" another image whose center point is contained in the flipped image. This will be fixed in a later version. Finer grain control over which image panel synchronization may be added later if there is sufficient user demand. Different intensity scalings may be selected using the "Scale" menu. Several common scalings are available. Please note that the Histogram Equalization as implemented is just that; it adjusts values to make the histogram curve more nearly approximate a uniform distribution curve. Also, a relatively new scaling using the inverse hyperbolic sine function is available. More information on this scaling is available in Lupton 2001. The parameterization used here follows the Beta parameterization mentioned there, except that we call "Beta" "sigma" for some reason. The image module attempts to estimate a reasonable sigma value. This value may be adjusted using the "Scale Parameters" dialog available via the "Scale" menu. Minimum and maximum values may also be set using this panel. The optional "-DVOTParser=..." argument allows you to use JAVOT for parsing VOTables instead of SAVOT. The option "-DCAS_URL=..." argument allows you to use a different CAS server from the default. The optional "-Xmx1024M" argument tells the Java Virtual Machine to use as much as 1024MB of RAM. You can, of course, substitute other values for 1024. The Java Virtual Machine will only use as much RAM as it needs up to the amount you specify. The default value is 32MB, so it's easy to run up against that ceiling with a large dataset and/or a large image. Please note that VO Enabled Mirage requires JRE version 1.4.2 or higher. Newest version of VO Extensions (v3.5) This executable jar needs a Mirage (version 0.3) jar in the same directory. Mirage must be obtained from Bell Labs. Mirage Select Mirage from the list and follow the instructions for download. Version 0.3 of Mirage is required for VO Enabled Mirage. Property.dat In order for Mirage to detect the astronomical imaging module, this configuration file, "Property.dat", must be present in the directory from which Mirage is invoked. Version 3.4 VO Extensions This executable jar needs a Mirage (version 0.3) jar in the same directory. Mirage must be obtained from Bell Labs. JAI 1.1.1_01 JAI is required for the astronomical imaging module to work. The JRE install for the appropriate OS is recommended. Installation notes are here. Version 2.2 VO Extensions This executable jar needs a Mirage (version 0.3) jar in the same directory and a working JAI installation. Mirage must be obtained from Bell Labs.